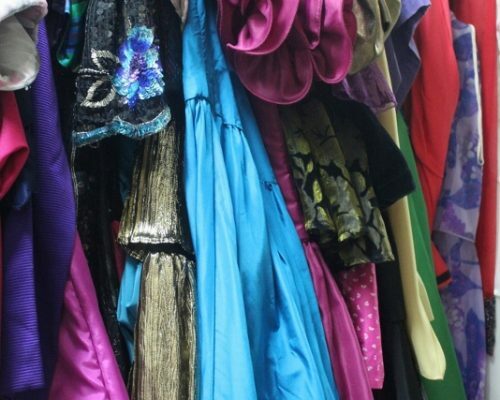 Based at our warehouse in the Brooklands area of Weybridge we house over 50,000 costumes. Our stock consists of police, services (including medical), legal wear, religious wear, work wear, children’s wear, period costumes, animals, hats, shoes and accessories – as well as substantial collections of contemporary ladieswear and menswear from the 1950’s through to the early 21st Century. We are also a highly experienced pantomime specialist, with several full show sets and individual costumes available for hire. Please feel free to contact us for any specific requirements or requests as we are always adding to our collection. For galleries of pictures please see the tabs below. We have a wide array of ladieswear from the 1950’s through to the 21st century, including a large selection of evening dresses and day dresses, with shoes, hats, and accessories. Alongside which, we have a wide variety of wedding dresses. Many of our items are vintage. Like the ladieswear we also have a wide selection of menswear from the 1950’s through to the 21st Century, including a large selection of suits, casual wear, dinner jackets, tailcoats with shoes, hats, and accessories. Many of our items are vintage. We have a modest collection of children’s clothing varying from contemporary to period, including a considerable school uniform section. Our vast police uniform stock covers the period of the late 20th century and early 21st century. We also supply riot police jumpsuits and helmets, stab vests, utility belts with accessories. Appropriate insignia and numbered epaulettes are also available. If you are in need of a more contemporary specification, we also stock high-vis and many other items to compile your required look. Within this stock is the entire original collection from the ITV drama ‘The Bill’. We have paramedics, air ambulance, nurses and doctors (amongst others), and scrubs in a large variety of colours and sizes. We stock workwear for lots of professions including hospitality, security, prison warden, prisoners, postal workers, couriers, beauticians and shop workers, amongst many others. For the legal profession we have barristers and other legal gowns including shirts, collars. There are also several legal wigs available. We have a large selection of religious outfits covering different denominations and positions, including various choir robes. We also have numerous graduation gowns and mortarboards. There is a varied stock of period costume from before Shakespeare to after Edwardian. Whilst most of our current collection is mainly of theatrical quality we do have a selection of costumes suitable for filming. We also have period style accessories including hats, shoes and jewellery. We are a panto specialist who design and make in-house. We have in stock complete sets of ‘Cinderella’, ‘Snow White’, ‘Jack and the Beanstalk’, and 2 versions of ‘Aladdin’. While some shows are more specific, many sets of costumes will serve multiple shows. In addition we have a big selection of individual costumes available to hire separately and are always adding sets of costumes throughout the year.